The former shrine name, ‘Inakuradaimyōjin’ is likely to be the ‘Inakuramyōjin’ referred to in the Kita-ura section of the Shimane district article in the Unyoushi. However, there is also an entry on a shrine named ‘Inasumimyōjin’. The Unyoushi quotes the Fudoki as listing an ‘Inasumi yashiro’ shrine hence the bay name at the time being ‘Inasmui-ura’. These entries certainly create some confusion. Currently, the shrine located in the west area of Kita-ura at the foot of Nagura peak is ‘Inazumi-jinja’. The shrine covering the whole of the Inazumi area is ‘Inaake-jinja’. It would seem the shrine names have undergone several changes over time. Both ‘Inazumi’ and ‘Inaake’ shrines are listed in the Fudoki and have been passed down and are now enshrined all around the Kita-ura area. It’s thought that ‘Inazumi’ was previously a shrine of the same pronunciation written with different characters, and ‘Inaake’ was once ‘Ina’ explaining the existence of the ‘Inakura’ shrine name. It’s likely that back when the 42- bay pilgrimage was at its peak, there were in fact two shrines along the route to worship at. It’s interesting to speculate which of these two shrines was the main object of worship since the whole basis of the pilgrimage is ‘one bay-one shrine’. There is confusion about this even in the official Shimane shrine listing, ‘Shinkoku Shimane’, but it’s worth noting the land name, ‘Nagura’ peak at the rear of Inazumi shrine. This ‘Nagura’ is contained in the name ‘Inagura’, perhaps related to Inaguradaimyōjin. The beautiful Kita ura and the Inazumi shore looks as if it’s being protected by both of the shrines located in the east and the west. Such scenery provides a sense of comfort. 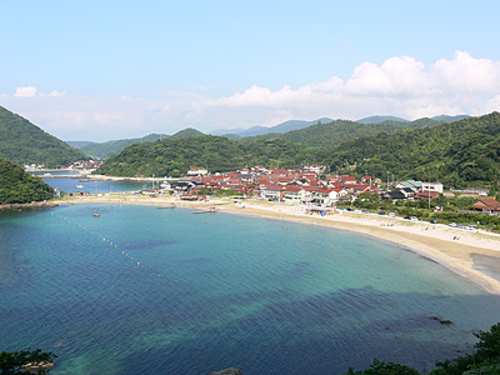 Kita-ura, with its white sands and bluish pine trees is the widest bathing area of the many sandy beaches in the east part of the Shimane peninsula. Popular among families and youngsters, with its nine different private houses, along with lodgings for school and university retreats, Kita-ura is a frequently visited area. It provides swimming opportunities to get over lunchtime tiredness and post-evening lecture fatigue. Every year on the national holiday, ‘Umi-no-hi’ (Ocean day-which takes place on the third Monday of July giving a three day weekend)), a tug of war event between bathers takes place on the stone area near the shrine. Inazumi-jinja is enshrined between the two beaches where this event occurs. Every year on January 3rd, the Sagicho ritual burning of new year decorations (known locally as Tondo), takes place. An o-mikoshi (miniature shrine) in the form of a model of the god Toshitoku-sama is paraded through the town. Perhaps in recognition of Toshitoku’s services, in the rest area for the o-mikoshi, children wear Tengu (goblin) and Lion masks and perform dances. The 5th of January sees the Shinto rituals performed for safety in the household and a sacred rice planting ritual, the Otaue. 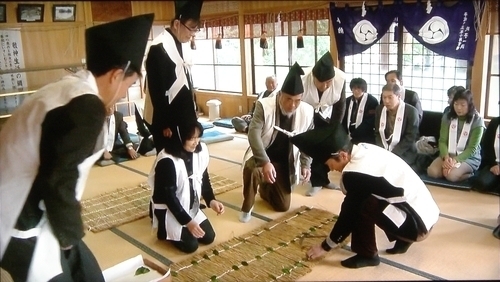 The Otaue, which prays for agricultural growth and the prosperity of descendants, includes the lining up of leaves from a Sakaki tree on straw mats in the hall of worship of the shrine. Women are permitted to participate in this event, too. The Omato shinji ritual takes place on Edaki mountain. 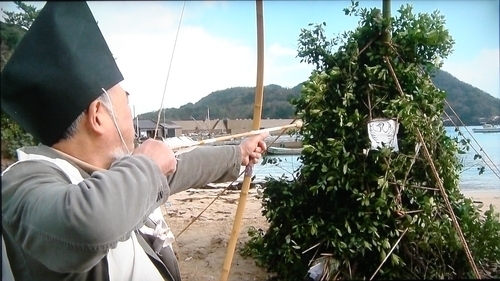 A Toya (organizer of events for shrines without a full time priest), shoots an arrow at a target on which is drawn the ‘Yatakarasu’, a three-legged crow. While it is not common on the Shimane peninsula to shoot at a target of a crow which usually symbolizes the sun or the Emperor Jinmu, it’s said that Oki island does hold a ritual of firing at paper images of a devil, crow and rat as part of an agricultural prosperity rite.